Ultrospec 10 Cell Density Meter measures the density of cells in suspension at 600 nm. Small, portable, and easy to use, the instrument can measure growth rates of E. coli, other bacteria, and yeast (it is not recommended for use with mammalian cell lines). The hand-held device can be easily employed in incubation cabinets, under anaerobic conditions, and in other areas in the laboratory where cells are cultured. Spillages can be easily wiped from the smooth surface, and the cell compartment area can be flushed with, for example, formaldehyde or ethylene oxide to sterilize it. 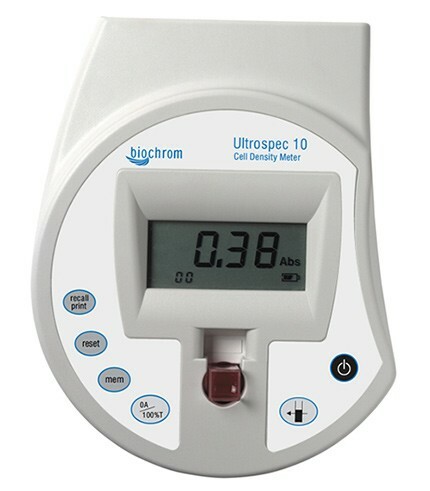 The Ultrospec 10 uses a 600 nm LED source in combination with advanced fiber optics to obtain OD600 measurements, which are comparable to those obtained with a standard spectrophotometer. Measurements can be sent via a serial lead to a printer or can be downloaded to an appropriate program on a personal computer for analysis. Rechargeable batteries provide nearly one month of cord-free use. • Battery operated for use where cells are actually cultured. • Easy to use, easy to clean, easy to sterilize. • Download results to a PC or printer for convenient data storage and retrieval. • Small, portable, and dedicated cell density OD600 measurement instrument.